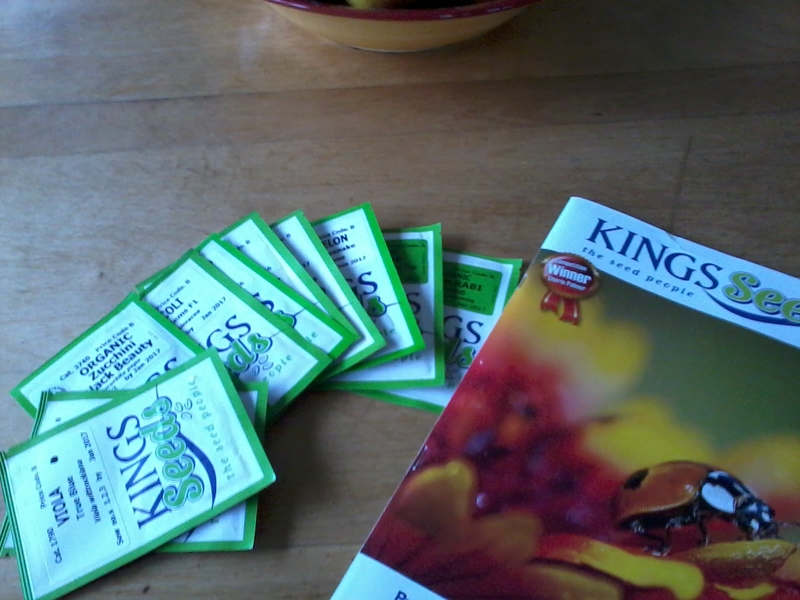 The Homestead operates as a democracy and at no time is this more apparent than that glorious day in late June when the new edition of the Kings Seed catalogue is crammed into our mailbox. Over the month or so following its arrival, the prized booklet sits front and centre on the coffee table to be thumbed through and scrawled over. Crosses appear beside the photo of that funky watermelon (Georgia Rattlesnake – who can resist that name?! ), the side shooting broccoli and yet another incarnation of the perfect carrot. Heavy, black circles mark one Homesteader’s idea of the perfect viola/marigold combination for the front garden border. Numbers are scrawled in the margins, crossed off, rewritten,overwritten, and sometimes unintentionally duplicated. Then the discussions begin. A little later (or much, depending on the mood) the definitive list is tabulated, the online form completed and, a couple of days later, those little green and white packets full of promise are in our possession. Don’t get us wrong, not every member of the Homestead has an undying passion for what we reap and sow. A couple of us don’t care a jot, being happy to go along with whatever ends up on their plate. But for some of us it is a big BIG deal. There’s an allegory regarding democracy that uses the premise of a group of people choosing the colour to paint a room. People vote by ranking their top three choices in order, with the first choice receiving 3 points, the second 2 and their least favourite 1; a system which results in the room being painted yellow. That being the colour no one selected as their first option, but got through on the strength of being everyone’s “it’ll do”. As a group, we want to avoid having to ever settle for yellow. Is that possible? So far, we seem to have swung it, but only by indulging in discussion: lots of it. Long, sometimes loud, always passionate thrashings out of the whys and whereabouts and how-manys. Yep, we know this isn’t an option for the governments of the world because it all takes a huge amount of time and also a healthy disregard for your personal popularity. Oh, and trust. How on earth is watermelon going to grow in ground that is predominantly sand? Yes, it is a cool name, but it’s going to need a heap of water, hence the name: WATERmelon. How environmentally friendly is planting something needing a resource our ground doesn’t retain…yes, I’ve heard of mulch…hang on a minute…by the duck pond, you say? On the other side of the fence where the ducks can’t…hmmm…catching the splashy runoff…yes…in that little unused suntrap garden…??? You know what, that could just work. Shall we give it a go? 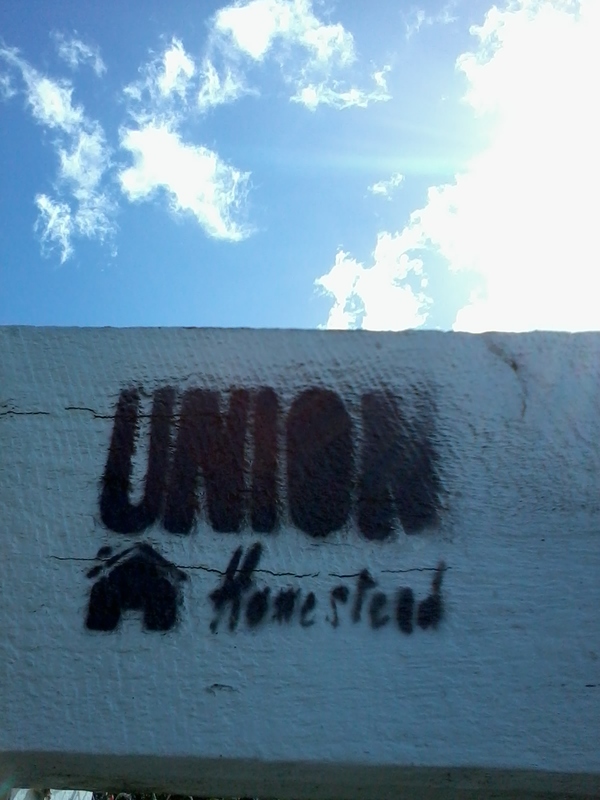 Democracy in action, Homestead style. And no one comes out singing a whiney Coldplay song. You’ll have to excuse our political spin on things, but it’s all hotting up here with our General Election hovering on the horizon. This week we’ve sat on the sidelines, we’re talking figuratively here, as folk have presented their ideas of “What this Country Needs”. We’ve also had the obligatory exposé of dirty politics and the resulting “who me?”s and “what about them?”s. The thing about democracy is that everyone gets a say, that’s what it’s all about, but without seeming to appear ostrichlike, as a group we’re over it. Luckily we’ve come up with an avoidance strategy. It’s quite simple really. Any facebook comments over three lines long: not reading it. Any discussions beginning “what we need is…”: politely excusing ourselves. As for the TV news, Radio news, and any conversation beginning, “what do you reckon…?” we employ the Three Wise Monkeys approach of see no evil, hear no evil, speak no evil. Call us uninformed, ill educated or unpatriotic but we’ll make up our own minds as we do every three years. We’ll get the official handouts and have a read, some of us might even wander down to the local hall to hear the Candidates tout their wares, and then come election day we’ll tick the boxes we feel most relevant. But back to more important things like the arrival of the seeds. Now they’re here, we’re all feeling a little apprehensive about the selection – especially the watermelon. What if it is a dismal failure? But then, what if it’s not? What if we actually get a couple Georgia Rattlesnakes to slurp our way through on the deck after a long, hot day on the Homestead? That’s the thing with sowing seeds, of watermelon or democracy: you’re never 100% sure what you’ll end up with. This entry was posted in Family, Garden, Union Homestead and tagged Aotearoa, Christchurch, conversation, democracy, discussion, elections, Family, garden, gardening, Georgia Rattlesnake, Kings Seeds, Labour, National, New Brighton, New Zealand, New Zealand elections, organic gardening, organics, Otautahi, planting, seeds, the Homestead, watermelon, watermelon. spring, winter. Bookmark the permalink. Democracy – you’re never 100% sure what you’ll end up with – that’s for sure. It’s like a legal kind of gambling :). Good luck with your election. My hubby says what we have in our household is a benevolent dictatorship. He can say that all he likes, with two teenage girls and all four of us with a fair streak of stubborn, what we really have is more like a democratic anarchic state with a nod to the benevolent dictator, just so he feels like we’re doing things his way :). I’m kidding, a little bit.